147 One Pound Mahon B212A Guernsey overprint series D94 154877, this is EF to UNC condition, and thus being the finest condition of all the 48 notes known in the hoard. 293 Twenty pounds Gill B358s type 2 series E22 200075 an issued note but overprinted on left hand serial number with Specimen Number in red A00 000000. Unusual and of the highest rarity and possibly unique, being the only one we have seen. EF. 161 Ten Shilling Dardanelles Overprint. T15. Z/4 010500.Rare. Near VF. 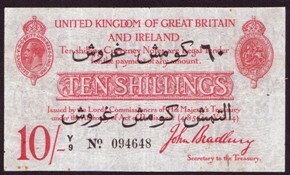 160 Ten Shilling Dardanelles Overprint. T15. Y/24 097023. Very scarce. Fine. 547 One Pound Peppiatt. B239C. Guernsey overprints (5) All E15A prefixes. Average EF. 538 One Pound Peppiatt. B239. Guernsey overprints (4) VF. 546 One Pound Peppiatt. B239C. Guernsey overprints (4) All E15A prefixes. All EF. 419 One Pound Catterns overprint. B225A. 036 261346. This is the finest condition Catterns note in the hoard. Only 74 Catterns overprints are known in total. EF to UNC. 798 Twenty Pounds Gill. B358S Type 2. Number E22 200075. Issued note. Overprinted on left hand serial number with Specimen Number in red A00 000000. Unusual and of the highest rarity and possibly unique, being the only one we have seen. EF. 451 One Pound Mahon overprint. B212A. D94 154877. This is EF to UNC condition, and thus being the finest condition of all the 48 notes known in the hoard. 534 One Pound Peppiatt overprint pair. B239C. E15A 781699 and E15A 781700. There is no full stop on the front. This pair is one of the best conditioned pairs known for this series. Only 398 Peppiatt overprints for this series known. EF to UNC. 536 One Pound Peppiatt overprint. B238A. Z Last series. This was the best condition last series note available from the hoard. Just 328 Peppiatt overprints known in this series. Near EF. 541 One Pound Peppiatt. B239A. Guernsey overprint. E15A 702193. Good VF. 539 One Pound Peppiatt. B239A. Guernsey overprint. E15A 639507. Good VF. 540 One Pound Peppiatt. B239A. Guernsey overprint. E15A 639970. VF. 542 One Pound Peppiatt. B239A. Guernsey overprint. E15A 761247. Near VF. 543 One Pound Peppiatt. B239A. Guernsey overprint. E45A 827117. Good VF. 544 One Pound Peppiatt. B239A. Guernsey overprints. B58A 861685. Good Fine. 3203 One Pound Catterns. B226A. Guernsey overprint, withdrawn from circulation September 18th 1941. Only five known and accompanied by pictures of the others which show that this note is the finest known in existence. 87A 573048 and VF and pleasing. 3219 One Pound Peppiatt. B239A. Guernsey overprints (10) Rare. VF to EF. 3199 One Pound Mahon overprint. B212A. H10 295499. Near EF condition. This is the only H last series known. Only 48 Mahon overprints are known in total. 3197 One Pound Mahon overprint. B212A. A76 760129. First Series. Only four are known in this first series, this being the best condition. There are just 48 Mahon overprints known in total. VF. 3201 One Pound Catterns overprint. B225A. First Series. H95 426734. There are only two first series notes known, this note being the best condition of the two. Just 74 Catterns overprints are known in total. Good VF. 3205 One Pound Peppiatt overprint. B238A. B First series. Only six are known in this series, this note being in the best condition of the six. There are just 328 known Peppiatt overprints of the B238A series. Near EF. 3202 One Pound Catterns overprint. B225A. J25 221295. VF condition. 3210 One Pound Peppiatt overprint. B239A. L01A 330400. Last series, the finest condition known in the hoard. EF. 3209 One Pound Peppiatt overprint. B239A. H74A 689841. The finest mid series condition known in the hoard. Virtually UNC condition. 3208 One Pound Peppiatt overprint. B239A. A78A 252354. First series, the finest condition known in the hoard. Good VF. 3222 One Pound Peppiatt. B239C. Guernsey overprint. E15A 639151. Good VF. 3204 One Pound Peppiatt overprint. B238A. 40Y 371856. Possibly the best condition known of all mid series B238A series notes. Just 328 Peppiatt overprints known in this series. Near EF. 3216 One Pound Peppiatt. B239A. Guernsey overprint. E15A 761311. VF.